The Command’s J-2 intelligence directorate reported recently in internal channels that "special interest aliens" are working with a known alien smuggling network in Latin America to reach the United States. The smuggling network was not identified. "Networks that specialize in smuggling individuals from regions of terrorist concern, mainly from the Afghanistan-Pakistan region, the Middle East, and East Africa, are indeed a concern for Southcom and other interagency security partners who support our country's national security," Garcia told the Washington Free Beacon. "There are major hubs that serve as entry points into the region for migrants from those areas of concern attempting to enter the U.S. along our border with Mexico," she said. "In 2015, we saw a total of 331,000 migrants enter the southwestern border between the U.S. and Mexico, of that we estimate more than 30,000 of those were from countries of terrorist concern," she said. However, the Southcom intelligence report revealed that the threat of Islamist terror infiltration is no longer theoretical. "This makes the case for Trump’s wall," said one American security official of the Southcom report. "These guys are doing whatever they want to get in the country." "An element that has been long recognized is that our ability to track people moving through transportation systems is an area that we must continue to devote efforts on, and the ease with which human traffickers are able to use our transportation systems to move people through the networks relatively undetected should give us all concern," Tidd said. Special interest aliens are described by the U.S. government as aliens who pose a potential terrorism threat coming from 34 nations in the Middle East, Africa, Southwest Asia, Central Asia, and East Asia. The list of states of concern includes Afghanistan, Iran, Kuwait, Iraq, Lebanon, Syria, Eritrea, Libya, Saudi Arabia, Pakistan, Indonesia, and Malaysia. Republican presidential nominee Donald Trump last week called for stepped up counterterrorism measures that he said would involve "extreme vetting" of immigrants in a bid to better screen out potential terrorists. Trump also has made a campaign theme the construction of a wall across the United States’ southern border as part of efforts to better control the flood of illegal immigrants. 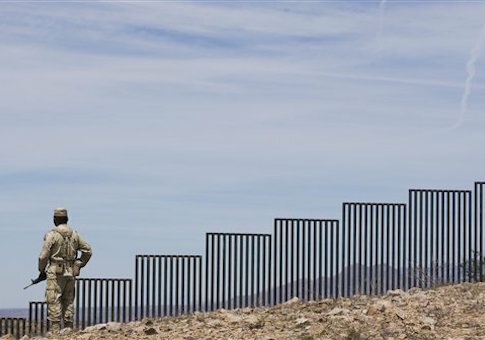 Joel Vargas, head of Contingent Security Services and a consultant to law enforcement agencies, said there is no evidence Sunni extremists are creating new relationships with alien smugglers. However, he said in an email that "existing smuggling networks from Central America are increasing their access." "We have intercepted immigrants coming from Asia but we have been unable to determine if they are extremists," Vargas said. "Our Sunni illegal migration coming from [Latin America] is very small. On the other hand, they can use the networks set up by the Shia." A report produced by Vargas for the International Airport, Seaport and Transport Police states that the Iran-backed Shiite terror group Hezbollah mainly has ties to Latin American through overseas Lebanese expatriates. Hezbollah recently increased support in transnational crime in the region by supply arms and training to various groups. "Hezbollah’s current goals appear to be focused on accruing resources rather than conducting offensive operations, however the group’s growing capabilities are still a clear threat to regional U.S. interests," the report said. "Iran’s involvement in Latin America is also increasing, and Hezbollah will likely be able to use these budding political and economic ties as cover for its operations." Vargas said Hezbollah’s networks in Latin America could be used by Sunni extremists to get to the United States. "That is a workable situation," he said. "If they disclose they are ISIL or any other group, I doubt that even the Shias will help out. Even [drug] cartels are killing anyone who appears extremist. It is bad for their business." According to Vargas, Guatemala remains a weak link for regional security services. A sophisticated alien smuggling operation that is capable of moving foreign nationals into the United States from Africa and other states has been centered in that Central American state for at least the past six years. The Washington Times reported in June that an international alien smuggling network centered in Brazil helped sneak illegal immigrants from Middle Eastern states to the United States, including an Afghan linked to a terror plot in North America. At least a dozen Middle Easterners reached the Western Hemisphere through this alien smuggling ring that facilitated travel to Mexico, the Times reported, quoting internal government documents. The aliens involved Palestinians, Pakistanis, and the Afghan man with ties to the Taliban. Some of the aliens were stopped before entering the United States but others succeeded in crossing the U.S. border. One transit route used in the past by alien smugglers was identified in a recent Justice Department alien smuggling case that traced illegal immigrants from Europe, the Middle East, and Africa to Honduras, then to Guatemala and finally to Mexico and into the United States. The cost of getting into the United States can reach $400 or more per person, and the illegal immigrants are provided with transportation, covert smuggling contacts along routes into the country, as well as instructions on how to illegally cross the U.S. border. The instructions in the past have included armed guides who ferry illegal aliens across U.S.-Mexico border rivers on inner tubes. Director of National Intelligence James Clapper testified during a Senate hearing in February that Islamic State terrorists would try to infiltrate the United State posing as immigrants. "That's one technique they've used is taking advantage of the torrent of migrants to insert operatives into that flow," Clapper said. "As well, they also have available to them—and are pretty skilled at phony passports so they can travel ostensibly as legitimate travelers as well." This entry was posted in National Security and tagged Illegal Immigration, ISIS. Bookmark the permalink.